The 30th Anniversary Collector's Edition of the action/adventure will charge onto Blu-ray this August. AnimEigo has just announced 'Shogun Assassin' for a Blu-ray release on August 24. The U.S. produced film condenses the first two Japanese 'Lone Wolf and Cub' movies based on the popular manga series. 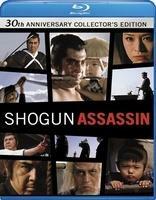 Specs have yet to be revealed, but supplements will include: Audio commentary with producer David Weisman, illustrator Jim Evans, and actor Gibran Evans (the English voice of Daigoro) and an Interview with Samuel L. Jackson about his fondness of Shogun Assassin and other samurai films, shot exclusively for this release in 2009. Suggested list price for the Blu-ray is $24.98. You can find the latest specs for 'Shogun Assassin' linked from our Blu-ray Release Schedule, where it's indexed under August 24.